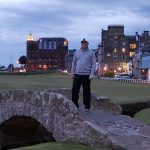 On my first golf trip to Scotland my goal was to start a journey that would lead to eventually completing the British Open Rota. 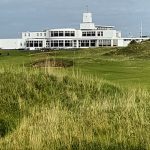 During that first golf trip across the pond I was lucky to be able to play the famous Scottish links courses of Carnoustie, Muirfield, and Royal Troon before finishing further south at Royal Birkdale, just outside of Liverpool, England. Upon my return to the United States, it wasn’t more than a month before I was already planning my next trip back to Scotland to check a few more courses off of the list. In my months of planning, one thing seemed to always catch my attention. The famous northern links course of Royal Dornoch. I had always been hesitant in the past to include Dornoch in my itinerary because it didn’t have the tournament history of the courses that had held a major tournament but more importantly it was so far north and out of the way. As time moved along, I just could not seem to get the place out of my mind. Eventually I got my hands on a book by Lorne Rubenstein and listened to some of the podcasts on Gray Loomis describing in incredible detail how special the village of Dornoch was. 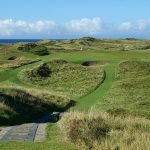 The desire to go to Royal Dornoch grew and I eventually decided I had to do whatever necessary to make my way to this historic course on the edge of the North Sea. I knew getting to Dornoch would require quite a bit of time and patience, especially since I don’t enjoying driving in Scotland. Nevertheless, I worked a plan that would take us from St. Andrews to Dornoch on the train which is not a straight stretch. It requires three stops to get from St. Andrews to this remote area of Scotland. First you have to transfer in Dundee, followed by a stop in Perth, and a final transfer in Inverness. Eventually your train travel ends in the small town of Tain where you need to arrange for a short taxi to take you into the seaside village of Dornoch. Dornoch is a stunning little golf town. One of the most memorable places I have visited in my two trips to Scotland. It is a small town but it also has a cosmopolitan feel to it. 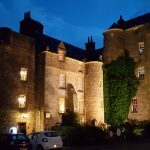 The village of Dornoch has plenty of nice hotel options, quaint bars and many high quality restaurants. There is a vibe in Dornoch that is unlike anywhere else I found in my golf travels in Europe. Now to what people come to Dornoch for, the golf. One of the most amazing things about Royal Dornoch is how perfectly carved into the natural landscape the course is, which allows it to flow from hole to hole. The west side of the course banks into the surrounding side and the east side gradually descends towards the shore of the North Sea. There are no blind shots at Royal Dornoch. It has upside down pan shaped elevated greens with your target squarely in front of you. From a purely golf course design standpoint, Royal Dornoch far exceeds any other links course in Scotland. If there is one place in Scotland that I would come back to and spend an extended period of time, it would be Royal Dornoch. I could play here two weeks in a row and would never get bored. If you are making a golf trip to Scotland please make sure this tiny little village in the northern part of the country is a part of your itinerary. Once you visit, I believe you will see why I have this ranked as my #1 course in Scotland. As CEO of Links Traveler, I am proud to oversee all of our operations in the United States, Scotland, Ireland, Northern Ireland, England & the Caribbean. Our company specializes in 100% customized golf vacations, and we are proud to offer each of our clients a 24/7 on-site concierge to make sure every detail of your experience is taken care of. 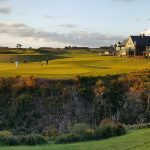 But what separates Links Traveler from most international golf tour operators is that we have taken the necessary time to visit and build strong relationships with hotel executives, restaurant owners, transportation providers & golf booking secretaries in the most desired golfing regions of the world. We look forward to working with you to create an experience of a lifetime! Copyright © 2016 - Links Traveler. All Rights Reserved.